Wakaba’s lifelong dream has finally come true: she’s finally a high school girl! Can her new friends survive her unbridled, and slightly awkward, enthusiasm? The girls suggest getting ice cream after school. 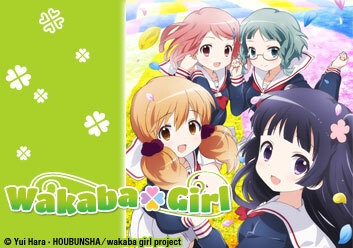 Wakaba will be heartbroken if anything interferes with her dream of obtaining her very own junk food with her friends. Wakaba sorely misunderstands what a “gyaru game” is. Shiba-san takes it upon herself to educate her. The girls get a glimpse into each others’ hobbies. The day has arrived! Wakaba finally gets to learn the fine art of “hanging out” with her friends. The girls also attempt to bake muffins at Moe’s house. Mao-chan wants to learn how to act like a rich girl to attract a boy she has a crush on. It’s a good thing she has a genuine rich girl for friend! The girls invite Wakaba to go swimming, but the only swimsuit she has is from elementary school. It’s a good thing Moeko has a spare that just might fit. Episode 7: Leaf 7 Are You A Sniper, By Any Chance? The girls want to take Wakaba with them to a summer festival, so they visit her mansion in an attempt to convince her family to let her stay out past curfew. The class is putting together an original play for the culture festival, and Wakaba (literally) can’t wait. Meanwhile, Shiba attempts to push the limits of her femininity. The long-awaited culture festival has finally arrived, and it’s Shiba’s time to shine in the contest! Only… she’s too sick to compete. Can Wakaba carry on in her place? Poor Moe-chan is horrible at sports! Like the other girls, she wants to branch out and attain a new goal, so she sets her mind to trying to do a back hip circle! The girls decide to spend New Year’s Even together. It’s Wakaba’s first time spending the night at a friend’s house, and she discovers something amazing: a kotatsu! Wakaba’s first snowfight ever ends abruptly when she collapses from a fever! As the girls help her get home, Wakaba reveals the source of her insecurities. After Wakaba misses three days of school, the girls leave class early to check on her. While happy to see them, Wakaba, sadly, tells them the bad news.